CNC milling machines are computer numerically controlled versions of milling machines. CNC milling machines offer the same abilities that manual milling machines do, however the CNC versions are programmable to change tooling and make their cuts based on the operator’s programming into the CPU. The ability for a CNC Milling Machine to hold and change tooling throughout the job significantly cuts down on operation time and cost. The flexibility that CNC Milling Machines have make them great for custom manufacturing projects. There are two main types of CNC milling machines: Vertical Axis and Horizontal Axis. We’ll be focusing on Vertical axis CNC mills in this post. A vertical axis CNC mill’s main body that rotates to perform the cutting of material is known as a spindle. The spindle rotates on the vertical axis at high speeds and is lowered to perform whichever process has been programmed. This is the spindle on one of our vertical CNC mills. Turret Mill: a turret mill’s spindle is mostly stationary (some turret mills allow for the raising an lowering of the spindle along the Z-axis), while the table (where the to-be cut material is clamped into) moves parallel and perpendicularly to the spindle, allowing the cutting instruments to serve their purpose. Bed Mill: a bed mill’s spindle moves parallel to it’s axis, while the table moves only perpendicular to the spindle’s axis. 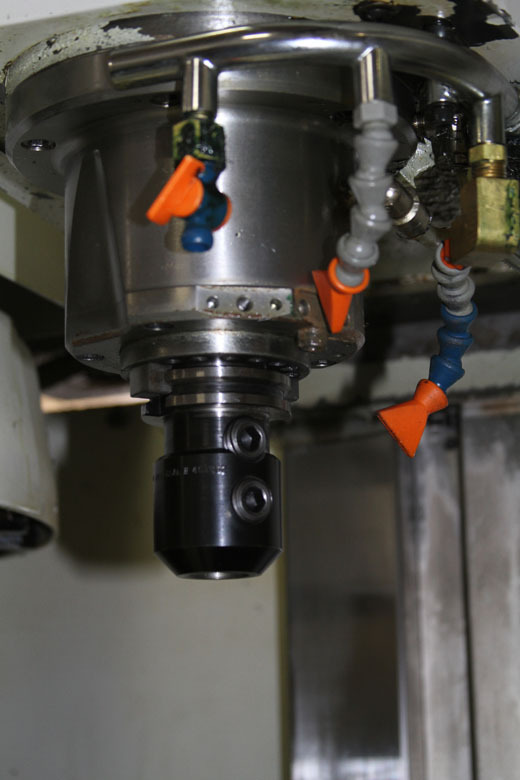 Tooling for CNC milling machines is a broad spectrum of instruments required to operate a machining center to its full potential. Vice grips, tool holders, and cutting tools (i.e. 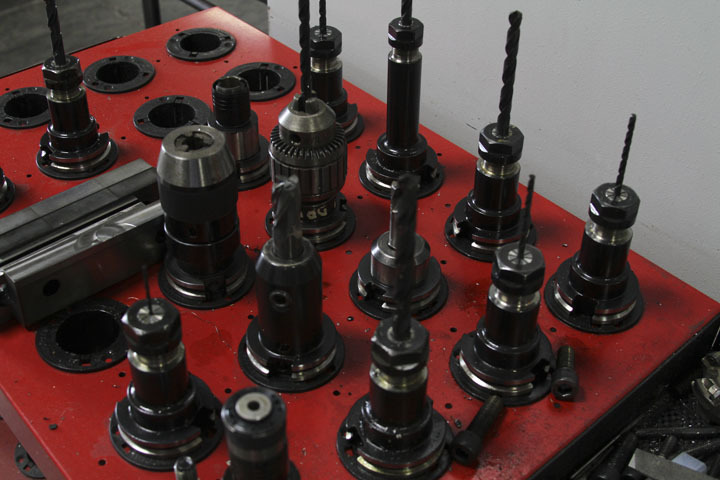 drills, taps, reamers) all fall within the general classification of, “tooling” when speaking in terms of CNC mills. All of these parts that make up the tooling category for CNC mills have separate, yet equally important functions. The vice grips are important for holding the material in place while being altered by the different cutting tools. The tool holders are inserted and secured into the spindle, and need to be the proper size for the spindle. This allows for high speed revolutions of the tooling (speeds can get up to 10,000 RPMs), while eliminating the possibility of tooling slippage. Some of our tooling for our Bridgeport CNC mill. What Are Some Best Uses For CNC Mills? CNC mills are great for short-run, custom manufacturing, and blocks for metal stamping dies. CNC mills cut via a circular rotation, thus creating revolution ridges. Here is a block that has been cut by a CNC milling machine. The revolution ridges are visible on the top, and are best eliminated by using a high precision grinder. 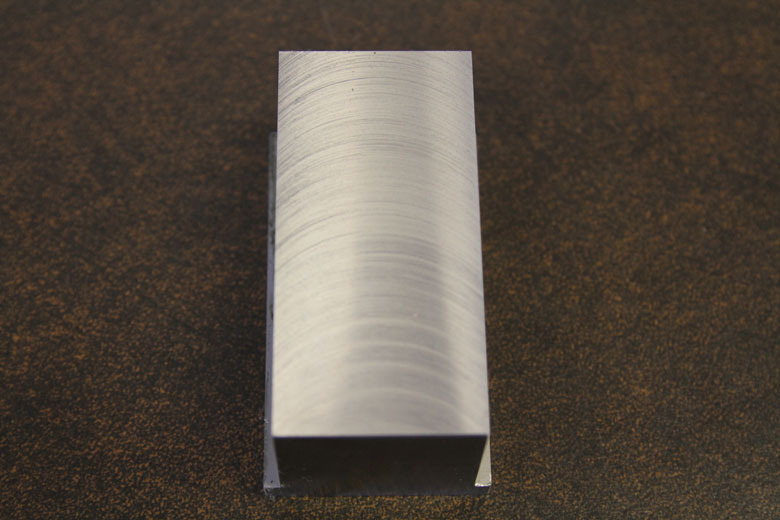 These revolution ridges don’t affect many custom manufacturing related parts, however when creating blocks for stamping dies, a grinder is typically need to smooth the parts out. CNC mills are quite accurate, most can hold up to .003 of an inch tolerance, however, they’re not quite as accurate as Wire EDM machines. We currently house two vertical CNC bed milling machines to make blocks for our in-house dies, and to handle outside custom manufacturing requests we receive. More information can be found about our custom manufacturing and CNC milling capabilites, here. This entry was posted in CNC Milling on September 3, 2013 by johnatmetalproducts.